Upperside is brown with dark eyespots. 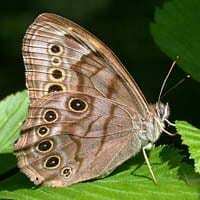 Underside is brown; submarginal row of 4 black spots on forewing is straight and the dark line inside it is sinuous. Spots are not surrounded by diffuse white.